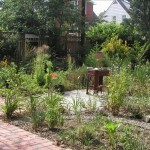 Landscape construction and plant materials should harmonize to create a unified look in a garden plan. For example, brick and finished wood materials blend well with fine- to medium- textured plant materials — ferns, astilbe and azalea. Rock, cut stone and rustic materials harmonize with coarse textured plants — rhododendrons, mahonia and viburnum. In this project, I used a combination of red brick, cut flagstone and River Jack rock. The diversity of hard scape elements in this newly installed “age-in-place” garden offer a variety in texture, color and scale.